Google unveiled today a new feature for Maps, which adds a layer for transit systems. So now you can use Google Maps to manage your public transit commute in much the same way you might check for traffic conditions. 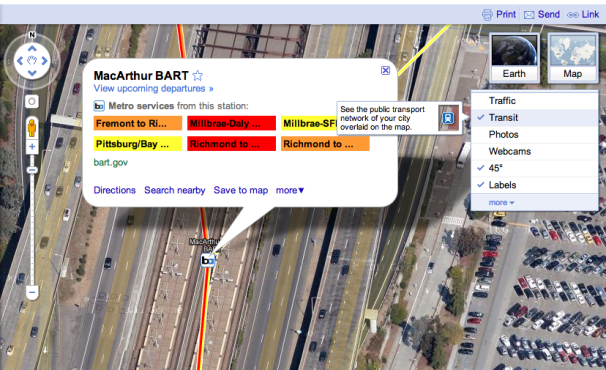 To use the new transit information features on your PC, point your browser to Google Maps. In the upper-right corner of the screen, select Transit from the layers box by putting a checkmark next to it. With the Transit layer activated, you'll see rail lines highlighted in yellow on your maps, complete with logos for the transit system the line is a part of. Bus lines will be highlighted in blue, with little blue bus icons at all the stops. Click on a transit station, and a dialog bubble will open with information about the lines served by that station. In my example, below, I'm looking at the six lines that pass through Oakland's MacArthur BART station. To get detailed schedule information click any of the lines. In the next screen, the main area of the window displays the near-future schedule for all lines. In the lower-right corner, Google Maps shows you which trains will be arriving next, in chronological order. In Android, Google Maps now works basically the same way. Tap a station to open up a listing of scheduled departures and lines serving that station.